Tuesday night we lit the first Chanukah candles and boys opening their presents. Unfortunately, the photos of the menorah with the candles burning were taken on JL’s camera and I do not have them yet. I did take my camera out and catch a few of the boys. 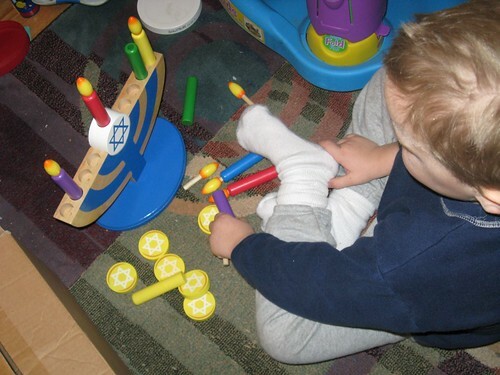 Here is NHL playing with an amazing wooden Chanukah set that he received from a family friend a two years ago. It is an amazing toy. There is a menorah that he can set up and then "light" his own candles. Here NHL is setting up his menorah and the Chanukah gelt (coins) are also seen. 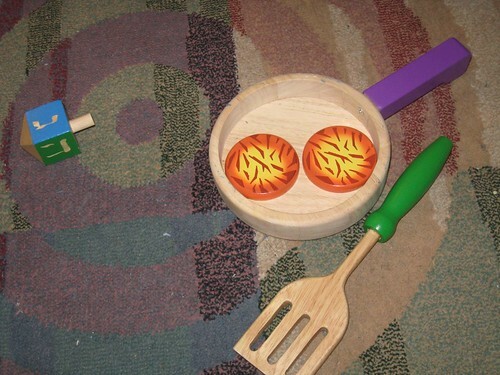 There is also a fry pan to make latkes, along with a spatula for flipping them. We can not forget the dreidel that must be there to play! Each night (and after school some times as well), NHL takes out his Chanukah set and plays with them. It is too cute to hear him reciting his own version of the prayers said when lightning the candles. I will have to try to get a video of that. On the first night when NHL was playing, JL was cooking dinner, and I fed JSL. 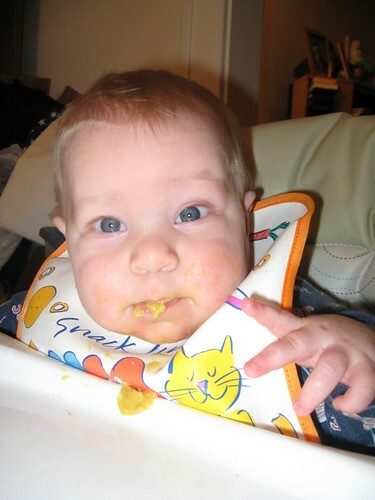 Last week I decided to pull out the baby food and give it a try. I just made rice cereal – VERY thick. The kid likes to "chew" so he accepted it. 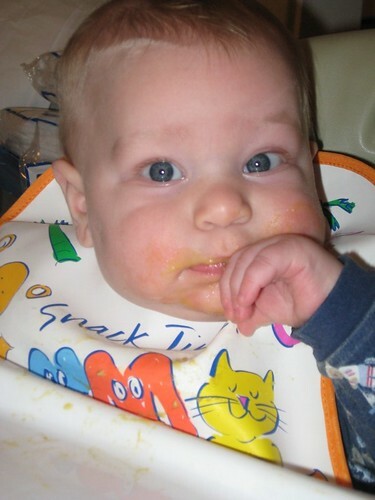 After a night or two of him gobbling that up, along with Cheerios and Gerber veggie puffs I decided to try something different. For the first night of Chanukah I added a "secret ingredient" to his rice cereal. Hey why not try it – right? 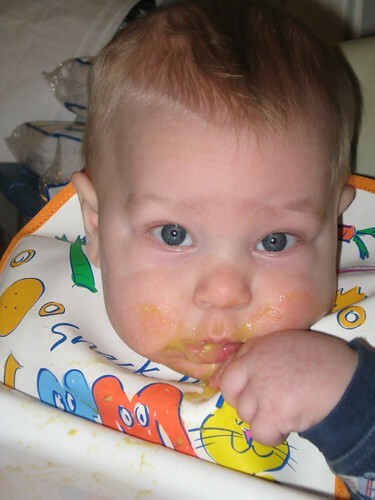 JSL will not eat his veggies if they are too soupy – a la baby food. So, this seemed like the perfect solution. I put half of a stage two jar of butternut squash into JSL’s rice cereal. He looked at me funny, noting it was different. He stopped and wanted to watch NHL playing. Then this is what he decided to do . 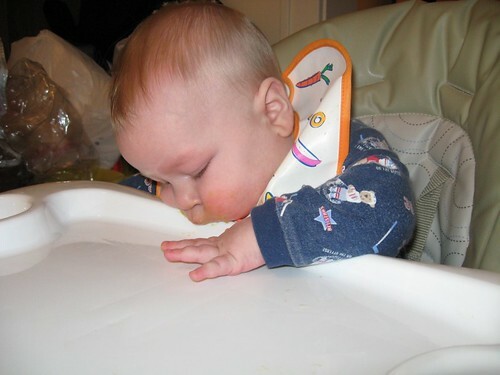 . .
After a while of chewing on the high chair tray he decided he wanted to try the rice cereal with my "secret ingredient" again. This time he was much more interested and gobbled it all up. Here are some of his faces with his big blue eyes. 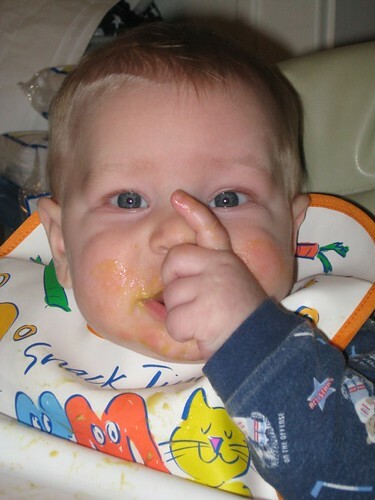 Thank goodness he was not coordinated enough to stick his fingers up his nose! Also note he is wearing his hockey shirt just for mommy! Then he got VERY serious about eating and seemed to be annoyed with Mommy and her flashy thing. Hmmm. . . unless it was when he was loading his diaper! More photos of Chanukah to come later. Now I am off to take care of a sick NHL. His teacher called me at 9:20 this morning to tell me he had a fever (almost 101) and to pick him up. Poor little guy asked her to rest and crashed when he got home. If everyone is feeling well we are going to have Chanukah dinner with my parents, grandmother, and brother and his family (in from out of town). You just can’t get a break from all the germs! I love NHL’s menorah–how cute! Shawna: Nope, if it is not one thing is seems to be another. I just put in an emergency call for our doctor. His temperature is soaring again to 102.5 in one ear and a little over 101 in the other. He is complaining of a tummy ache, headache, and booty ache. Not sure where the last one came from. Off to answer the phone and figure out what we are doing.